Map of the Bear River watershed. From its source the Bear River flows north cutting across the southwest corner of Wyoming passing through Evanston then weaving along the Utah-Wyoming state line as it flows north. It turns northwest into Bear Lake County, Idaho, and flows through the Bear Lake Valley in Idaho, past Montpelier where it receives the short Bear Lake Outlet Canal that drains Bear Lake, which straddles the Idaho-Utah border. At Soda Springs, near the north end of the Wasatch Range, the Bear River turns abruptly south, flowing past Preston in the broad Cache Valley that extends north from Logan, Utah. It re-enters northern Utah, meandering south past Cornish and Newton. It is impounded to form the Cutler Reservoir, where it receives the Little Bear River from the south. From the west end of Cutler Reservoir it flows south through the Bear River Valley of Utah past Bear River City. It receives the Malad River from the north just before emptying into the mud flats of a broad bay on the east side of the Great Salt Lake, approximately 10 miles (16 km) southwest of Brigham City. 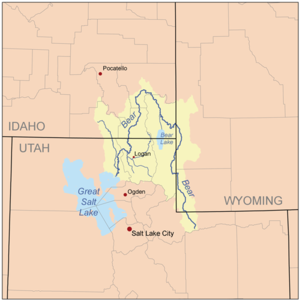 The river is used extensively for irrigation in the farming valleys through which it flows in its lower reaches in Idaho and northern Utah. The lower 10 miles (16 km) of the river near its delta on the Great Salt Lake are protected as part of Bear River Migratory Bird Refuge. 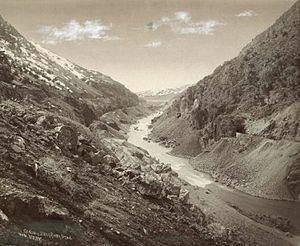 The river valley was inhabited by the Shoshone people. Fur trappers from the Hudson's Bay Company began to penetrate the area, exploring south from the Snake River as early as 1812. John C. Frémont explored the area in 1843, and the Mormon Trail crossed the Bear River south of Evanston. The California and Oregon Trails followed the Bear River north out of Wyoming to Fort Hall in Idaho. Some of the travelers on the trails chose to stay, populating the Bear River Valleys of Idaho and Utah. The Cache Valley was an early destination for Mormon pioneers in the late 1840s. On January 29, 1863 troops of the United States Army attacked a Shoshone winter village in the Cache Valley, slaughtering many of its inhabitants. The incident has come to be known as the Bear River Massacre. ^ "USGS Gage #10126000 on the Bear River near Corinne, Utah". National Water Information System. U.S. Geological Survey. Retrieved 2010-06-13. ^ Bridgwater, William & Kurtz, Seymour. editors. The Columbia Encyclopedia. (Third Edition). New York: Columbia University Press, 1963. p. 183. ^ "USGS topographic maps". ACME Mapper. Retrieved 1 November 2010. ^ Bright, R.C., 1963, Pleistocene Lakes Thatcher and Bonneville, southeastern Idaho, PhD dissertation, University of Minnesota, 292 pgs. ^ Bright, R.C., 1960, Geology of the Cleveland area, southeastern Idaho, MS Thesis, University of Utah, 262 pgs. ^ Hochberg, A., 1996, Aminostratigraphy of Thatcher Basin, SE Idaho: Reassessment of Pleistocene lakes, MS thesis, Utah State University, 112 pgs. ^ a b c d e f g h i j k l m n o p q r s t u v w Arrington, Leonard J. (1966). Beet sugar in the West; a history of the Utah-Idaho Sugar Company, 1891-1966. University of Washington Press. OCLC 234150. Wikimedia Commons has media related to Bear River (Great Salt Lake).